To millions of people, young and young with lots of experience, Christmas is a magical time. On the same notion, there's Disney magic. 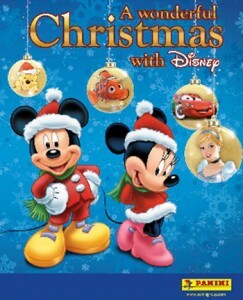 Mash the two together and you have 2013 Panini A Magical Christmas with Disney stickers. The collection brings together a bunch of different characters from all corners of the animated Disney Universe. Princesses, Phineas and Ferb, the land of Cars, The Lion King, Winnie the Pooh, Finding Nemo and more. A 48-page color album holds the collection. Boxes come with 50 packs of stickers. There is also combo display boxes that have 100 packs and 20 albums. Christmas-themed Disney sets aren't strangers to the hobby. In 2004, Upper Deck released Disney Holiday Treasures, a trading card set that also included figurines. curious – – we bought these books and some stickers for our daughter but our books are green with a different front cover. they say 2013 on the back. they are panini. will the stickers be compatible?? jenny � If the title is the same, it should be. The album pictured here was originally a mock-up sample so it could have changed from when we posted the article to when they were released. Where can I buy more stickers for this album? I have the green one from 2013.